We publish a message from the Olesnica police, which prepared a “reflective” lesson for students of SP7. Police officers from Napoleonic very often conduct safety lessons and share their experience and knowledge about safety with their students. 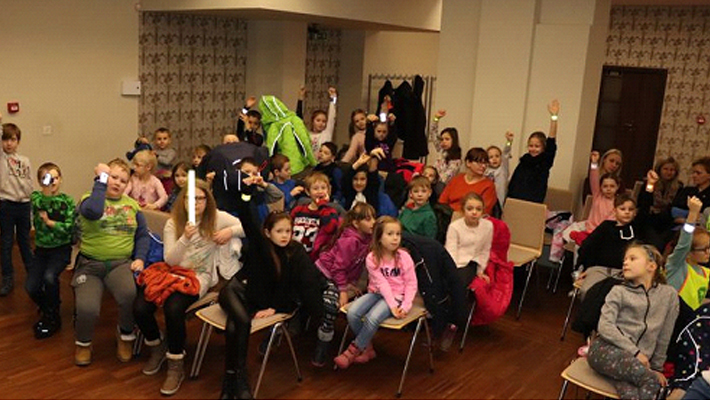 Yesterday the lesson about reflections took place in the BiFK hall in Napoleonic with students from the Primary School No. 7. The subject of the course was primarily road safety, and in particular wearing retro-reflective tapes, not only on backpacks but also on other materials of clothing. Reflective tapes may include items attached to clothing, headbands, vests, and leashes. It is important to place them: the reflective tapes are recommended to be placed at the level of the knees, hands, around the center of the chest and back – then we will be sure that they are clearly visible to other road users. Police officers devoted the most attention to reflections, giving examples of situations in which they often saved lives with pedestrians. As emphasized by the uniform, it is thanks to such elements that pedestrians are more visible. After sunset, the driver of the car sees a pedestrian or a cyclist without reflections when it is 20-30 meters in front of the vehicle. This part of the road car travels within an incomplete second. When the pedestrian or cyclist has reflective materials on the garment, it is visible to the driver from a distance of 120-150 meters. The driver has over 5 seconds to respond. Let’s be seen for motorists, especially now, when the dark falls more and earlier. The use of reflective vests by all pedestrians moving around in undeveloped area is a DUTY. The use of reflectors by pedestrians in the city is a REASON.